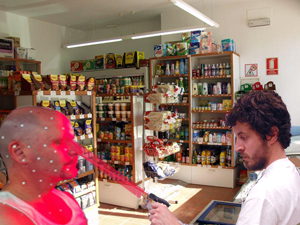 A local shop keeper claims to have developed a ‘face scanning’ tool, that can automatically target fat people and then deny them biscuits or doughnuts. But sceptics have claimed that the inventor is just shouting ‘beep!’ himself, and then making personal remarks about local known pie botherers. Woodrow Gunther, owner of Harold’s second-favourite supermarket, ‘Guntco’s’, claims he developed the device to ‘help save the public from themselves’. “If I see someone waddle into the store and sweat their way straight past the salad area, I can persuade them to turn back thanks to the help of technology”, claimed Gunther. Pippa Delaney was incensed when the machine claimed to spot brown sauce on her chin, and refused to sell her a ham balm and a packet of rubbing bacon. Paul Watts, manager at rival store Tesco, conceded that their facial scanning technology might also be able to target unhealthy customers with optimised adverts, but probably wouldn’t bother, given the state of Gunther’s face.